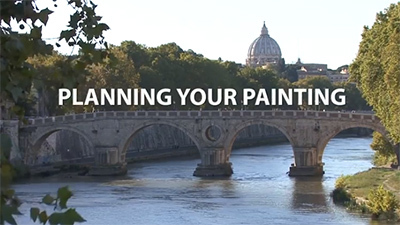 Herman Pekel handles paint with impressive confidence which, combined with his enthusiastic and engaging personality, makes his film, A Passion for Paint, highly enjoyable to watch. Believing it is important to have a connection with the subjects you paint, his first two canvases focus on the area he grew up in, north east of Melbourne, Australia. Pekel begins by mapping in key lines, and then washes colour over the canvas to start defining the form. He demonstrates his empathy with the landscape as he quickly builds a sense of depth, layering transparent darks, and creating rhythmic, fluid lines. 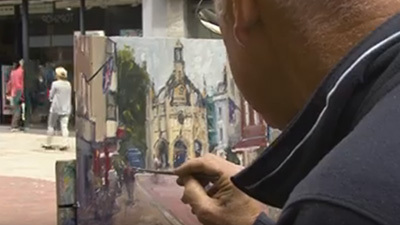 He then moves in with a credit card, wielding it like a palette knife, pushing the thick paint around sculpturally, creating areas of foreground texture that bring life to the composition. Highlights in the trees are added with subtlety, and the lightest points are reserved until the very end. For the third painting, Pekel moves down to St Kilda on an absolutely beautiful day. 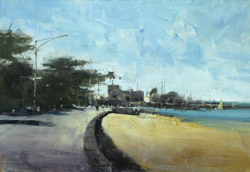 He sets up his canvas to paint a view of the beachfront, starting with the same impressionistic approach. He washes in the foundation colours broadly, before using a square- ended brush to define the shape of the buildings, along with his trusty credit card for texture on the sand. 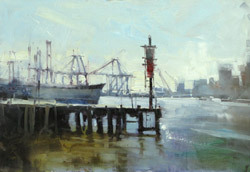 Staying with water, he goes towards the mouth of the River Yarra, settling on an industrial view of the harbour, with harsh metal structures against a muted view of the city rising beyond. As he nears the end of the painting, a huge ship sails through, tempting Pekel to include it. 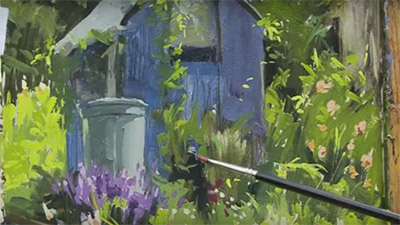 He is never afraid to experiment, but once added, he decides not to keep it, enabling him to demonstrate how he can remove an item as fast as it was painted, scraping it off, and then overpainting and blending until no evidence is left. Finally, tired after the two previous paintings, he goes down to Williamstown, reducing a varnished paper ground to a narrow landscape format. Despite battling with his easel wobbling in the wind, Pekel masterfully maps in the features of the buildings. This is an excellent film. Pekel is so clearly enjoying himself as he paints, that his exuberance is infectious. 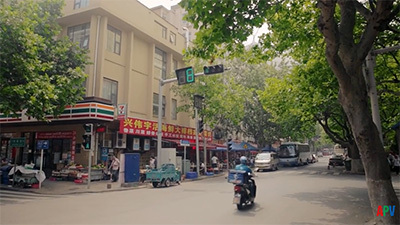 He inspires viewers to capture the atmosphere of a place without getting hung up on rules. 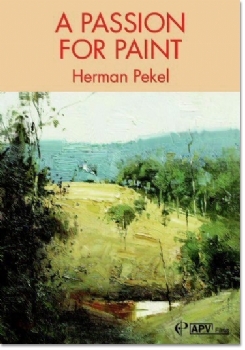 Herman Pekel, in A Passion for Paint delights in �the luscious feel of oil paint�, which is his medium for several contrasting, yet equally absorbing and instructive plein-air paintings, first working in the Australian bush north of Melbourne and later on the waterfront in the city itself. He stresses the need for an empathy with the subject. �It is hard to paint anything unless you fully understand it,� he says. 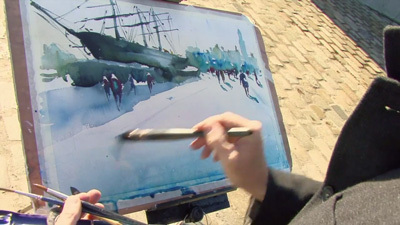 And, to capture that empathy, the sense of place and the special quality of light and atmosphere in each scene, he shows how to address and balance various considerations for representation and expression, as well as the use of the medium and the arbitrary qualities as the painting progresses. 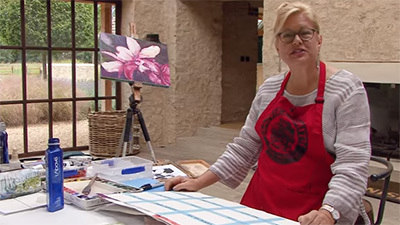 What a delight to watch this totally unique painter. His passion for paint comes over and his lovely analogies really help you to see and understand what he is doing. This dvd can definitely be classed as a tutorial because you get so much information from it, but it is top class entertainment too. BRILLIANT! 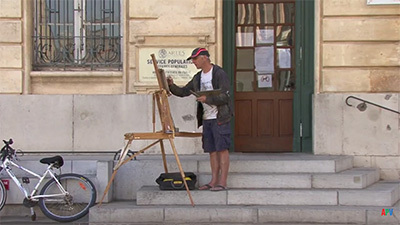 I thoroughly enjoyed this dvd, full of instruction and his enthusiasm just draws one into the painting. I look forward to future paintings by this exceptional artist.